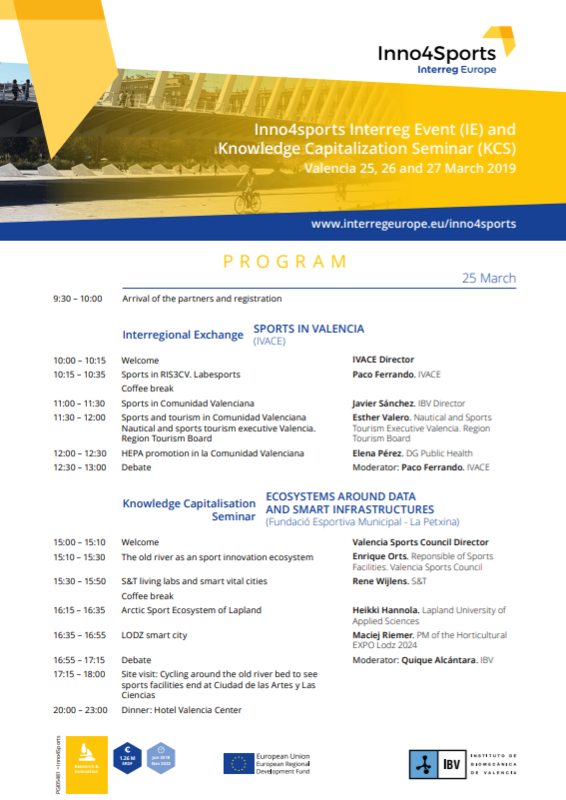 From March 25th to 27th, the Valencian partners IBV and IVACE of the Inno4Sports project will host the Inno4Sports Interreg Event (IE) and the Knowledge Capitalization Seminar (KCS). Sport experts from all over Europe and project partners from Holland, Finland, Hungary, Poland and Belgium will be in Valencia to discuss the sport ecosystems of the regions involved in the project. Three days of intense work on how to improve innovation in sport and how to generate socio-economic development in sectors such as tourism and health. Inno4Sports Project places in the context of socio economic transformations in Europe that open up new dimensions for the capitalisation of sports ecosystems. The potentials of Sport ecosystems have started to have been recognized at EU level as drivers for innovation and growth with a high potential for cross-sectoral spill-overs and interlinkages with various societal and economic fields. Still, at regional levels, they remain underdeveloped, due to existing inconsistencies and an underrepresentation of the potentials created by sports innovation within RIS3 and regional development programmes.